The gun is actually smaller and nicer than the Britannia one and I wish I`d known this a few months back when I bought the Britannia gun for a modelling project! 6-piece gun: Carriage, 2-wheels, gun, sighting gear, seat/trail; a nice level of detail. The crew all wear Italian Army uniform, the gunners are both in helmet, the seated one has no kit visible his kneeling loader has a haversack and water-bottle. The NCO is in field cap, kneeling with binoculars in his right hand, no kit visible. Nice poses, great gun, lots of flash on the figures. Two figures in normal Italian uniform in helmet, with ankle boots and rolled socks. The Brixa mortar is a gem, really nice detail, the gunner sits astride his weapon, his only visible kit is a water-bottle. The No2 crouches on all fours with a bomb ready to re-load, he has a water-bottle and haversack. nice figures, great detail. Three figures; gun leader standing with map in left hand, netted helmet, Parson`s jacket, belt with pouches and pistol holster. Kneel gunner, plain helmet w/goggles, belt with pouches no other kit. Standing gunner with shell, netted helmet, belt with pouches no other kit. A little flash, the kneeling figure had mould lines too. 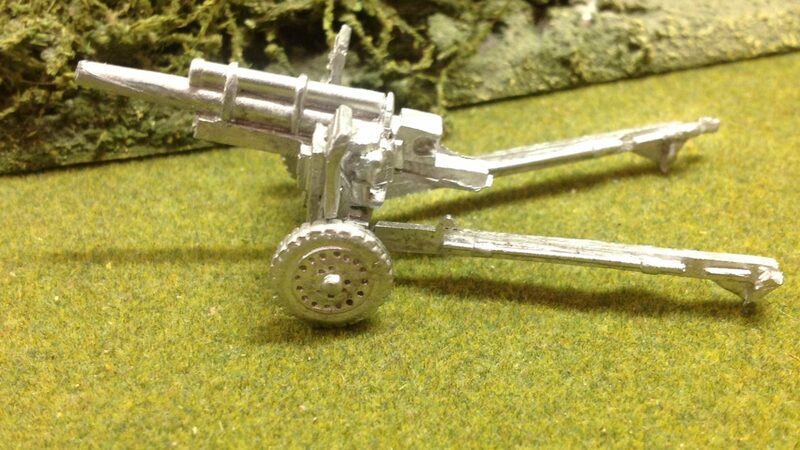 Very simple 6-part white metal model, two wheels, two trail arms, axle/shield and gun. Went together simply, no fuss rugged wargames model, there was a small amount of flash which was easy to clean.